Ford Motor Credit, the finance arm of the second-largest US automaker, and General Electric, the world's biggest maker of diesel locomotives and jet engines, were first out of the gate with big new corporate bond issues in January. GE sold $4 billion of investment-grade bonds, as it sought to get an early start on its issuance, since it has more debt maturing this year than any other US company. 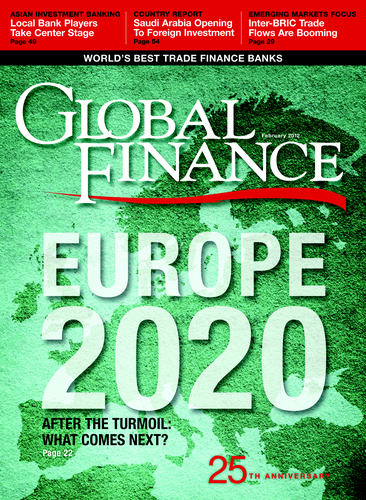 GE has $78.7 billion of bonds coming due in 2012, according to Bloomberg. GE's January 4 sale comprised $2 billion of three-year notes and $1 billion each of five-year and 10-year debt through its finance unit, GE Capital. The company also issued an additional $1 billion of its 10-year, 4.65% debentures. In the high-yield bond market, Ford Motor Credit issued $1 billion by reopening a pair of issues from last year, adding $300 million to notes maturing in January 2015 and $700 million to debentures due in May 2018. Ford brand US auto sales surpassed 2 million in 2011 for the first time in four years, with a gain of 17% over 2010. The company's debt rating is only one step below investment grade, and it is expected to graduate from the high-yield market later this year. Ford Motor Credit was the biggest issuer of high-yield bonds in December 2011, adding another $1 billion to its issuance of 5.875% notes launched last July. 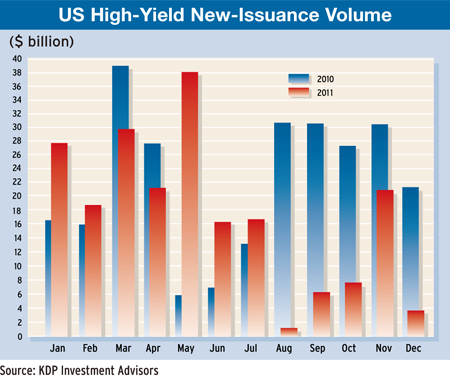 Total US high-yield new issuance in December slumped to $3.9 billion from $20.7 billion in November, according to US group KDP Investment Advisors. After a record pace in the first half of 2011, issuance of high-yield debt slowed considerably in the second half of last year, amid volatile market conditions and the sovereign debt crisis in Europe. The volume of global corporate high-yield debt totaled $278 billion in 2011, down 14% from 2010, and the second-largest annual volume on record, according to Thomson Reuters. With $65 billion raised, the second half of last year was the slowest six-month period for global high-yield new issues since the first half of 2009. J.P. Morgan was the leading manager of global high-yield debt last year, with more than $31 billion of proceeds from 173 deals. Bank of America Merrill Lynch was second, followed by Deutsche Bank, Credit Suisse and Citi. Global debt underwriting activity of all types totaled $5 trillion in 2011, a 7% decrease from 2010, according to Thomson Reuters. Activity in the financials sector accounted for more than half of all new issues last year. The fastest-growing sectors were technology and healthcare, with gains of 15% each. Thanks to its strength in agency and sovereign-debt underwriting, Barclays Capital topped the global debt league tables for a second straight year. It managed 1,000 issues with total proceeds of $344 billion. The Euro Aggregate Corporate Index generated excess returns of 116 basis points in December, according to Barclays Capital. However, overall 2011 excess returns on high-grade European corporates based on the index were still negative: -393 basis points, the worst since 2008. Financial institutions produced the largest losses last year, followed by building materials and electric utilities. The top performers were wireless telecoms, pharmaceuticals, consumer products and food and beverages. New issuance of corporate debt from emerging markets companies declined 6% to $314 billion during 2011. Companies based in India, Brazil, Mexico and Russia led the new issuance, accounting for 50% of the emerging markets total.